Our part loft conversions are the perfect solution if you wish to transform your unused loft space into a multi-functional area that’s ideal for use as an additional room, or as highly practical storage space. Extremely popular with our clients, our dedicated team of experts based in Tadcaster cover the Yorkshire region undertaking these part build conversions to the highest possible standard. 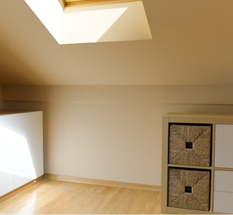 Partial loft conversions add value and significant additional space to your home, whilst still being incredibly affordable. A typical part attic conversion consists of a new floor being laid, insertion of structured walls, ceilings and a new staircase providing you with an easily-accessible, completely functional space for you to utilise as you wish, whether that be for toy storage or a walk in wardrobe area to house your clothes. You’re then free to complete the rest of the loft conversion yourself, saving you additional labour costs and giving you the freedom to add your own touch to your loft conversion! With minimum disruption to the rest of your home, our part loft conversions can be completed quickly and efficiently at fantastic prices. Simply give the professionals at Interloft Conversions a call today for more information!